This quality package is a stunning audio document from one of Britain's most enchanted experimental outfits from the 1970s and who better to release it all than Daniel Miller's Mute emporium. This showcases the original Cabaret Voltaire trio of Richard H.Kirk, Stephen Mallinder and the enigmatic Chris Watson, three normal(ish) youths in the soon to be hotbed city of Sheffield, slaving over hot valves and revoxes, a few years before a fair percentage of the nation's youth realised that you didn't have to play your instruments like a virtuoso to make records. As the title suggests, these three CDs chart the progress from the groups earliest experiments to the time when they put out their first vinyl recordings through Rough Trade. This was also material that was recorded before they holed themselves up in their legendary Western Works studio. All this was recorded in Watson's loft. Richard Kirk had asked permission from Watson and Mallinder to put this incredible archive out into public view. The first CD is all stark and stripped down with a couple of very literally named tracks such as 'Treated Guitar' and 'Treated Clarinet', which gives the feel that this really was something which was more of a sound seance session rather than a 'let's form a band' scenario. It must be said that all these tracks have benefitted from todays technology, hardly a hint of hiss, considering their vintage. CD number two is the real gem for me, mapping out pieces recorded between 1975 and '76 and includes the excellent 'Bedtime Stories', which sounds like CV playing Throbbing Gristle, which at this time of course, TG and CV didn't know each other existed and to think that each unit was operating at different poles in the UK, before either of them had released any recordings and that they covered a similar ground in attitude as well as sound is fascinating. Let's face it, I don't think there were many people in 1974/5 who were creating forms of new music via merged templates of harsh electronics, the writings of Burroughs and tapes of found sound all melded into a new dark age puree (cut-up and roll...phew!). This was all from an era when the NME used to have pictures of a strutting Robert Plant on their front covers, and nearly every callow youth had a copy of Deep Purple's 'Made In Japan' constantly on the turntable (it should have been Can's 'Soon Over Babaluma'! ). CD 3 shows the Cabs material just prior to the first flurry of official releases, revealing that they had watered down some of their tracks for public consumption, eventhough they sure sounded strange to my 17 year old brain in 1978. There are a few early versions of tracks that would later appear on the 'Extended Play' EP and their first album 'Mix Up', all raw as fresh liver, roll up roll up. 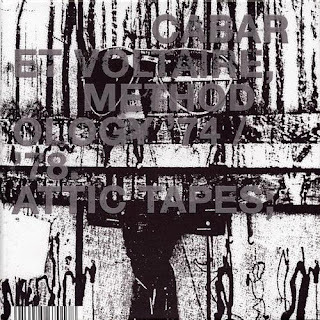 The instrumentation on these recordings is synthesizer, tapes, flute, electric reeds, vox organ, electric guitar, bass guitar, hot-wired effects units, voices- both of the trio and found speech- put through a number of interesting distortion devices and lots of studied and concentrated tape recorder and effects manipulation. Also worthy of mention is that this box set ISN'T an extended version of their '1974-1976' collection that was released in 1980 (which is also brilliant by the way). Anyone who is interested in the more bonkers moments of Faust, early Throbbing Gristle or (more so) the rare recordings (1974-76) from Michegan's maverick experimentalists- Destroy All Monsters- then this is for you. So many years on from their first official releases and well worth the wait. "I say... bartender, pour a triple brandy for Mr. Kirk this instant! ".